System by Design Inc is proud to partners with Tributaries® Cable. An American company based in Orlando, Florida. 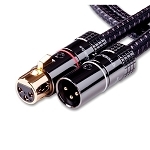 Unlike many companies in the cable business, their products are only based on high quality tried and tested materials and on scientific principles. One of the reasons why Tributaries have won the coveted AV industry award "Inside Track Magazine's Supplier Loyalty Award" a record Thirteen out of Fifteen times in the past Fifteen years! See what's new, availability or more information.